08-Jun-2018 -- During the same week, I attended the 2018 ESA annual meeting in Copenhagen and an interscience and research meeting in Bergen. I saved two days for tourism at the end of this busy week and spent one day to visit 60N 6E and another day to visit 56N 13E. We rented a car to drive from Copenhagen to Malmö using the Grønnehave - Helsingborg ferry in the morning and driving over the Øresund Bridge on the return trip. This was a perfect occasion to visit 56N 13E. The point is easy to reach by car. 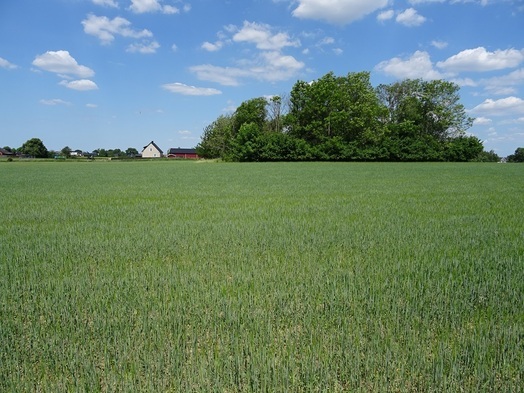 It lies in a cultivated field very close to an abandoned farm where it is easy to park. We walked on the field edge and stayed there for the picture shooting in order to avoid ripping the plants. We didn’t see anybody at the time of our visit except a young deer hidden in the south hedge who ran in front of us as we approached. The town of Malmö is worth a visit because it is a perfect mix of historical and modern architecture combining the old red citadel and the twisted tower overlooking the Baltic Sea.